Patients of viral fever receiving treatment at Majkot of Junichande Rural Municipality in Jajarkot district on Monday. 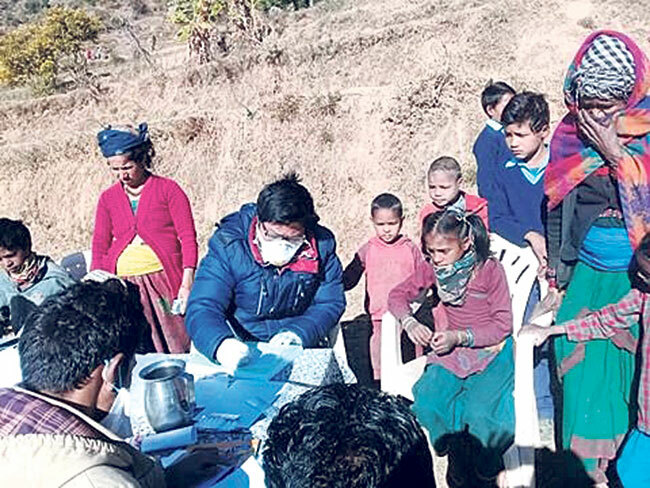 Krishna Bahadur Khatri, a lab technician deployed by District Health Office in Junichande Rural Municipality, informed that children and elderly citizens affected by viral fever have been worst hit by the cold. Khatri informed that altogether three camps have been fixed in the village and more than 500 patients have been treated so far. Dr. Pawan Shakya of Primary Health Center, Garkhakot; Hari Bahadur Singh, in-charge of Wadkule Health Post, and other health workers have intensified health campaigns in affected villages. According to Dr. Shakya, a viral fever outbreak has engulfed Syala, Maugan and Wadkule villages of Junichande Rural Municipality. Ram Bahadur Nepali, chief of the District Health Office (DHO), informed that the office has sent a large number of medicines to villages for treatment of patients. Health workers have even reached to the houses of locals to treat their illness. Earlier, it was reported that as many as nine people lost their lives due to viral fever. Kashiram Neupane, a local of Junichande, said that the viral fever has been controlled to some extent from spreading with the efforts of health workers and doctors. "After the availability of medicines and treatment facility, the number of patients has reduced slightly," Neupane informed. Locals were terrorized after discovering similar symptoms of common cold, headache, fever, diarrhea, loss of appetite, cough among others since the last two weeks. Meanwhile, people have vented their ire toward the newly elected representatives and leaders for neglecting their plights. They have also taken to social media to express their disappointment toward the carefree attitude of leaders and elected representatives. Most of the representatives are not present in the village at the moment. People from poor and marginalized communities had expected that they would no longer have to spend their winter without warm clothes and proper shelter after the formation of the local government. Unfortunately, that became just a dream.